Oklahoma City-based Continental Resources Inc. scored some success in recent wells completed in Blaine County, one of the three main counties that make up the STACK play. A recent filing of completion reports released by the Corporation Commission and published by OK Energy Today showed billionaire Harold Hamm’s company had four completed wells in Blaine County. Three were significant oil producers while one was a large gas well. 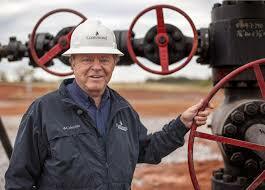 The gas well, the Robbie Ray located about 3 miles northeast of Weatherford produced 14,388 Mcf of natural gas. It actually had a spud date of February 2016 with completion made in December 2016 but the report was not made until recently. The largest of the three oil wells produced 1,376 barrels a day. The Laura Fiu is located about 3 miles southeast of Watonga. Drilling started in June of last year with completion made in December. The nearby Sherry Lanelle produced 1,008 barrels a day. The third well, the Glenwood Pearl Fiu was drilled about 4.5 miles west of Watonga right along highway US 270. Its production was 1,311 barrels a day.